An absentee dad turns granddad and steals the show in Keeping Up With the Steins. First of all, Keeping Up With the Steins isn’t to be confused with 2002’s Kissing Jessica Stein. Between the Judaism and the low-budget depictions of life in ritzy neighborhoods, the two films would make an interesting double bill. Second, Keeping Up With the Steins comes to Tarrant County a week after Father’s Day, which is too bad because it would have been nice to see then (though if you have a boy who’s old enough to start thinking about his bar mitzvah, it’s still right on the money). This cushy comedy about three generations of Jewish men in present-day Beverly Hills should be as bland as a middling tv sitcom, and for significant stretches, that’s exactly what it is. However, it turns out to have a delightful sexagenarian trump card. The movie begins at the bar mitzvah party thrown by Hollywood agent Arnie Stein (Larry Miller) for his son. The gigantic affair takes place on the ocean liner Queen Elizabeth II and includes a staged re-creation of a scene from Titanic, a hip-hop version of “Hava Nagila” done by rapper DJ Quik, and a yarmulke-wearing Shamu jumping through a Star-of-David-shaped hoop. Watching it all enviously is Arnie’s former underling turned professional rival Adam Fiedler (Jeremy Piven), whose own son Benjamin (Daryl Sabara) is turning 13 in a few months. Still stinging from the dinky bar mitzvah party that he was given by his father Irwin (Garry Marshall), Adam is hellbent on throwing an even more lavish party than the Steins’. The fidgety and insecure Benjamin, on the other hand, would sooner have a few friends over to his house for blintzes and cake than rent out Dodger Stadium for the occasion. The game of one-upsmanship between Adam and Arnie provides surprisingly little comic juice, despite the opportunities for putting a Jewish or a Hollywood spin on the story (and also despite the presence of Cheryl Hines as a temperamental party planner). The filmmakers display little creativity when it comes to Adam’s ideas for the party, which need to be absolutely insane — celebrity appearances, F-14 flyovers, whatever. Director Scott Marshall and screenwriter Mark Zakarin seem to recognize that they’re weak here and don’t spend too much time on this plotline. What a shameful waste of Jeremy Piven, though, and his pinpoint comic timing. For all the screen time that he logs, this acerbic and resourceful actor has precious few chances to be funny. One of those chances comes in a scene when Adam reacts to a hitch in the event planning by calmly getting into his SUV before letting loose a string of profanities that we can’t hear. The film could have used more of this. The comedy only gets going when Benjamin decides to submarine his dad by sending Irwin an invitation with a date two weeks earlier than the actual party. His father and grandfather haven’t spoken since Irwin abandoned his wife and son to live on an Indian reservation with a younger woman named Sandy Frost (Daryl Hannah), who goes by her Native American name of Sacred Feather and embraces the vegan lifestyle. Everything about the character of Irwin feels very real, from his distinctively uncool wardrobe (t-shirts and shorts with ponchos and a ponytail) to his mixed feelings about his life choices. Garry Marshall, who is the director’s father in real life, gives a terrific performance in a role that fits his personality like the proverbial glove. Whether Irwin’s skinny-dipping with Sacred Feather in the Fiedlers’ pool or facing down a coked-up road-rage case (Adam Goldberg), Marshall brings the funny in a major way. The scenes between him and Sabara — the boy from the Spy Kids series — are especially good, as the old man bonds with the grandson he barely knows and helps guide the kid through his early adolescence, not to mention his shpilkes about reading the Haftorah in public for the ceremony. 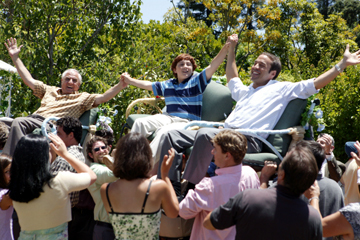 Irwin is such a vivid presence that you almost can’t blame the filmmakers for making the character into the ultimate source of wisdom on the significance of the bar mitzvah, going so far as to gently reprove the principal of Benjamin’s Hebrew school (Richard Benjamin) for being more concerned about plugging his book and tv appearances than teaching the Torah. To make matters worse, Irwin and Adam play out the same scene at least four times, as the prodigal dad begs forgiveness from his son. 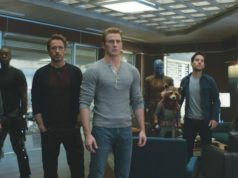 This is why the movie feels padded out, even though it runs less than 90 minutes. Still, Marshall père assisted by Marshall fils winds up walking away with this comedy tucked firmly under his arm, and you pretty much don’t mind. Keeping Up With the Steins ends with a celebrity (whose identity is too good a joke to give away) turning up at Benjamin’s party to sing “Hava Nagila,” and by that time this breezy and inoffensive comedy will make even the goyim feel like joining the Fiedlers in the hora. Starring Daryl Sabara, Garry Marshall, and Jeremy Piven. Directed by Scott Marshall. Written by Mark Zakarin. Rated PG-13.